Discussion in 'WWII General' started by Wolfy, Apr 18, 2009. I've noticed that few soldiers seem to be wearing glasses in WW2 even though a large portion of the population wore them. Were glasses specially issued in Axis/Allied military or were men with poor vision just not accepted into combat units? Did troops carry a spare pair of glasses just in case their original pair was lost or destroyed in action? *unrelated to WW2, but do modern soldiers wear contacts or do they have to wear glasses? Introduction: Although the US Army set high standards when it came to physical requirements for paratroopers, a number of Airborne soldiers did wear eyeglasses. Even in combat. These are the glasses of an Infantry Captain in the 101st of Normandy Campaign fame. The Story: This Battle Relic is part of the collection of one of Battle Detective’s sources, who’s proven unquestionably reliable in previous investigations. It’s an object that was quite uncommon among US Army paratroopers; the elite Sky Soldiers of World War Two. See photos at link of soldiers wearing glasses. "This young soldier's eyeglasses are the Army's standard metal frame issue." "Over the last three years, the military has found that about 85 percent of their eyeglass wearing personnel can benefit from laser eye surgery, and 96 percent of those who get the surgery end up with 20/20, or better, vision. This procedure is considered a good investment, as troops who no longer have to wear glasses are much better off. Every soldier knows what a hassle eyeglasses can be in combat, because they get a taste of it in basic training. The running and jumping, the dust, explosions and general chaos often send eyeglasses flying, or leave them damaged. Moreover, combat soldiers are now more likely to use eyepiece sights (sniper scopes, night scopes, or the sight for the main gun on an M-1 tank), and these are easier to use without glasses." Thank for the good links, marcust. I have terrible eyesight myself and I find myself wondering if I should get surgery. During WW2 the standard of pyhsical fitness declined allowing soldier with glasses to serve. I know of one British Army serviceman who rose to the rank of Staff sargeant who was conscripted into the army with only one eye (and had lost one as a child), needless to say he was in a service corp. The spectacles issued were special to the forces in that a gas resperator would fit over them, a bit like John Lennon glasses. 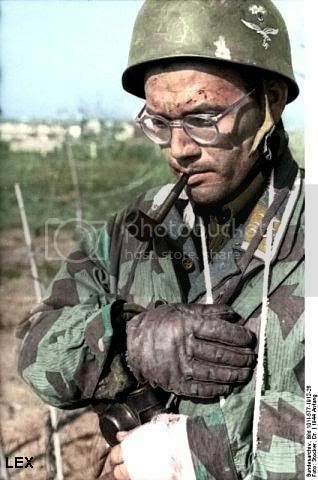 From photos you see more older soldiers in service units, engineers, explosive specialists, adminstraion however even front line soldiers wore glasses. I have even seen a photo of an Australian Army sharpshooter/sniper in WW1 at Galipoli wearing bins! officially in WW1 the Australian had a high pyhsical standard and were supposed not to recruit short sighted soldiers. I cannot find an up to date figure for the British Army (they are short of recruits). The current requirement in Ireland for Infantry and Air Corps is 20/20 but this probably means in Ireland (which is a neutral country) the number of potential recruits exceeds the number required. In my time my arm of service only required 20/40 binocular and 20/60 in one eye (without correction)full colour vision but infantry required officially required 20/20 vision full colour vision at that time but later in the early 1980s I remember seeing quite a few infantrymen wearing glasses. Colour vision is a requirement for specialist such as electrical engineers and other specialists grades. In US service the current requirment for infantry 11B is 20/20 in on eye and 20/100 in the other correctable, same requirement for Armour 19K and no published requirement for military police 31b/d apart for Red Green colour vision differential. Re surgery if your sight has been stable for a while and you are older than 22 then it is worth considering. I'm legally blind in both eyes. I can only read words in a book if my eyes are three or four inches away (without contacts or glasses, of course). Everything else is a swirl of colors. I'd be utterly useless if I lost my glasses (or contacts) in combat. My eyesight rapidly deteriorated at an extraordinary rate when I was small but has stabilized (somewhat) ever since. That's a shame, most of this commercial "lasic and laser eye surgery" is to correct corparatively low level sight problems like 20/40 to 20/100 etc which to some extent I consider cosmetic work (that is a person could life comfortably without intervention) but you should get a consult with specialist, because it is certainly medical not cosmetic and life should not be a struggle like that. Rommel was near sighted, one book claims. >*unrelated to WW2, but do modern soldiers wear contacts or do they have to wear glasses? In the U.S. Army of the Cold War, eyeglasses were issued. The style of the eyeglasses was so ugly the troops called them "birth control glasses". Contacts are the kind of hassle that one does not want when deployed in the field. In Normandy 1944 the Germans had "Stomach", "Ear" etc units which were practically useless in normal battle conditions I guess. How do you give orders to a soldier who cannot hear you? what are the "stomach" and "ear" units? These are nick names. Those units were made of people suffering from certain diseases, like chronic stomach disease units were stomach units, people who could not hear were ear units etc. Its something in British forces that is relevant to the job you are going to do as you point out. I was sent for a special medical after my initial careers information office medical becuase of an old eye scar, luckilly, my future role didnt need 20 20 vision so I scraped through...On changing roles later it was again a major problem and resulted in few more medicals before they admitted the reason for wanting to fail me was that I had bad eyesight right eye due to the scar, so being right handed I would have problems sighting the old SLR. I pointed out successfully that for the last 6 years I had been managing quite well and the marksman badge on my right sleeve surely meant something.....Jobsworths abound everywhere. Passed me as fit to change roles with provisio, must wear glasses. I never did though. Jobsworths abound everywhere. Passed me as fit to change roles with provisio, must wear glasses. I never did though. They certanly do, it is impossible to correct vision defects caused on corneal scar tissue with spectacles it can only help with balance and reduce strain caused by the scar. A diopter sight such as fitted to SLR (little hole) tends to correct for minor defects anyway , mine on test was 6/9 left and 6/6- on right, its pretty bad now about 6/18 L and 6/12 R with a bit of scaring on the left. The instructers were phased that I could shoot with either eye and both open. I've always disliked the SLR-even as a cadet I said I wanted the .303 back, and I got sick of the that hory old rant by instructors telling recruits that the thing was more accurate than they could shoot! Thats the same experienece I had on the range. Instructors couldnt understand how I bent over the slr and even though in right shoulder I had left eye and cheek bent over the damn thing and still hit the target when needed..
You misunderstood I can shoot from either shoulder using either eye (I'm left handed but can use either at will). The only thing I ever got for buddies on the range was flying cartridge cases from the left and we had an idiot drop a Sterling once which was interesting. Maybe a simple reason for the lack of glasses-wearing soldiers is the lack of opticians in the 1940s. Many soldiers went into battle not knowing they needed glasses. Never tried shooting without my glasses but did fire a Browning Hi-Power left handed and got a better score than with my natural right, go figure! A very good question but one that may be difficult to find the answers. There are many pictures of soldiers with glasses (i wear them myself) but usually they are support troops or in the rear. The soviets had a policy, up to modern day, of not assigning spectacle wearers to the front line since the disadvantages were obvious - "Ivan has lost his glasses and cant see enough to load the guns!" I have never heard any official policies but it would seem the Germans may have had the same policy, since in all the photos, men wearing glasses at the front are rare. As the war went on this policy no doubt was modified since every side was scrambling for warm bodies! But you have to look at many photographs to find any "four eyes" on any side - perhaps the propagandists simply ignored them. I had a patient one time that was glasses dependent during the war. He memorized the eye chart and was able to present himself as having 20/20 vision so that he could be a forward artillery observer officer. He landed on D+2 and lost his spare pair of glasses when his jeep was destroyed by German artillery in at St Lo. He lost his second (his only) pair of glasses when he was blown out of the second story of a barn in Belgium. He essentially was not hurt, cuts and scrapes, but he could not see. At the aid station, he asked for a new pair of glasses. He was evacuated on up the line, even though he was not really injured. It was only when he got to Paris and ran into an friend who worked at the hospital he was at, did he find out why he was not sent back to his unit. They thought he had lost his mind because he was asking for glasses (which forward observers were not allowed to need) and he was asking to go back to the fight. His friend helped him get it straightened out, but he was transferred to the quartermasters, because of his eyesight.